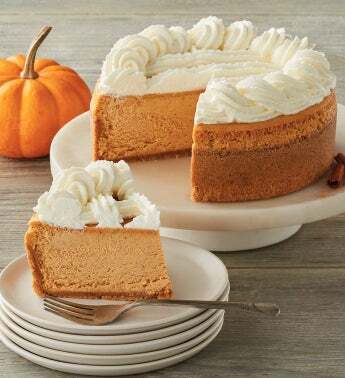 The Cheesecake Factory® Pumpkin Cheesecake - 7"
A pleasing combination of pumpkin pie and cheesecake, this cheesecake from The Cheesecake Factory® is crafted with a graham cracker crust and a spiced pumpkin filling. Topped with whipped cream rosettes, this cheesecake is a fantastic way to celebrate during the holidays. Delight in the comforting and festive flavors of fall with this cheesecake, available from mid-October through the holiday season.